It’s one of those writer axioms: you HAVE to write every day. It’s like brushing your teeth, or showering, or drinking tea. You HAVE to do it every day. Or else you’ll die! Okay, I made that last bit up. So, yeah, write every day. It’s good advice. The only way to get better at something is to do it over and over again. Like in Groundhog Day, but over different days. It trains you, makes the process automatic in a way and lets you get the dross out of your system (although apparently the dross refills every once in a while, but that’s just an extra reason to keep on writing). Yeah, no, it isn’t. Besides the fact that most people write digitally nowadays, writing is also more than just that physical act of churning out words. While a set goal of X pages, X scenes, or X words can definitely help spur you on and keep you on track (2 pages a day means a draft of a feature script in 45 days), a writer will have more to worry about than just words. Who are these people I’m writing about? What’s the best way to make my story relate to my audience? What exactly are the rules of this genre again? And how can I break them? Those are just a few, very broad questions that a good writer will be pondering at some stage in writing their script, play, novel or story. Surely taking the time to find the answers to them counts as writing, too? And let’s not forget about simply plotting out your story, of finding the structure to your screenplay, or doing research. If you’re still in the plotting and prep stage for your story, setting a page count has little use. Of course when you’re progressing to the actual writing of your story in the narrow sense, then yeah, a page count may well help. A little caveat, though. Chasing the page or word count can also hold you back from improving what you’ve written. 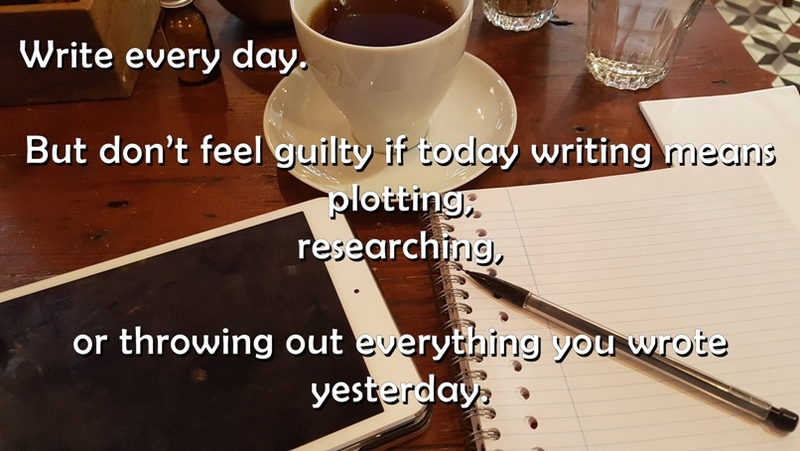 Many writers, myself included, like to go over what we wrote before, editing it or giving notes to ourselves, and getting back into the flow of the story, to springboard into those next few scenes and pages. And sometimes you realise that what you wrote was crap, or pretty okay but not what the story needs, or any other reason why it’s better to bin that section and start over. It’s a great way to improve your story as you write it, but if you are hung up on increasing your word count, it’s tempting to stick with it and continue down a possible blind alley – one you’ll only have to write your way out of in the next draft anyway. So a bit of quality control as you go along can be a great time saver. So yes, write every day, but don’t feel that you’re not a writer when you’re not racking up the word count. Set that goal if you want and if you feel it helps, but feel liberated by the thought that sometimes your goal can just be to finish that book or essay you need for research; to write a background bio for you main characters, to plot their emotional journey through the story; to spend time evaluating what you’ve written so far and if it’s working; to take some time to rewatch that classic film or episode for its genre conventions or simply for inspiration. Just don’t forget: at some point you’ll actually have to sit down and put words to paper – or hard drive.